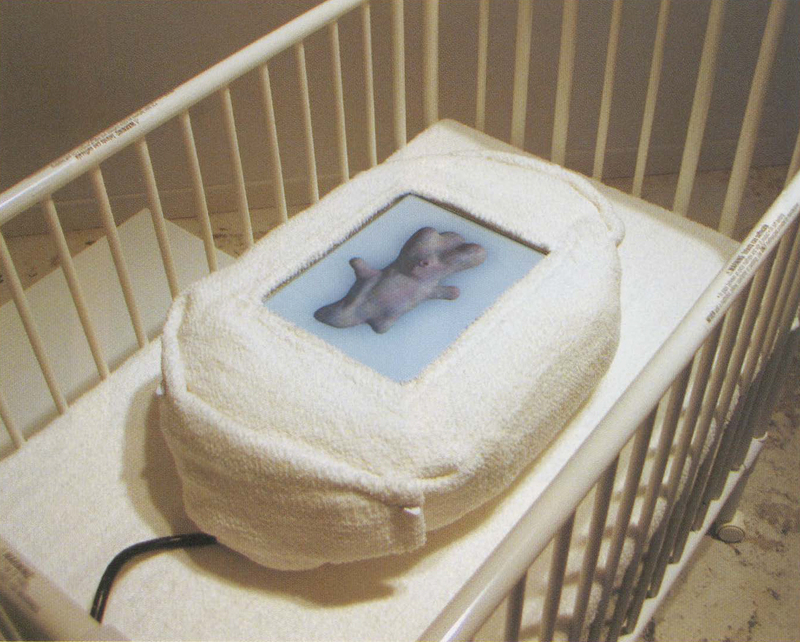 In little_one, viewers engage with a 3D-rendered virtual creature by lifting its padded LCD monitor and holding it as one would hold an infant, cradling it in their arms and gazing down at it. Though amorphous and repulsive, the creature on screen nonetheless elicits feelings of empathy through its lifelike sounds and motions. little_one responds much as an infant would, crying and grasping when tipped or shaken, its heavy head falling in the direction of gravity. If held gently, it “coos” happily. My goal is to investigate what it is that makes us feel connected to other living beings. Through the use of 3D computer graphics and interactive programming, I have created a series of works depicting forms that seem to be living, or derived from living beings. These virtual objects are clearly fictitious, yet they can inspire empathy, dis­gust, and fascination. They are intended to elicit an awareness of the dis-junctions that can occur between one’s emotional and intellectual reactions, and provoke the viewer to consider the process through which we come to identify with the objects of our gaze. In little_one, this exploration is pursued with even greater intensity. No experience is more intimate than holding an infant. Clearly, the creature on the screen is artificial, yet it is hard to resist the desire to nurture it. Is it the haptic interface or the kinesthetic knowledge that is called into play, thus lowering our intellectual guard? Or is it that its situation connects us to feelings of helplessness that we’ve all had before? Technically, little_one is relatively simple. But when viewers pick up the piece and implicitly suspend their disbelief (if only for a few moments), little_one feels like a fragile being in their care. little_one is an interactive, computer-based sculpture. In it, a 3D animated and rendered “creature” moves and makes sounds in real time depending on how its LCD monitor housing is being held. The piece uses a variety of sensors (an accelerometer/inclinometer, an IR motion detector and a pressure switch), the outputs of which are digitized via an infusionsystems iCubeX and transmitted via MIDI to an interactive multimedia application authored in Macromedia Director. In the application, this input is processed to determine the presence of a viewer, whether the piece has been picked up, and subsequently, the position of the monitor housing. Playback of a variety of video clips (including a Quicklime VR, which is used for the continuous two-axis movement) is then determined by sensor input. The application also keeps track of the position of the housing over time.